The 6th International Economic Summit of Russia and the OIC Countries, hosted last week in Kazan, the capital of Russia’s Republic of Tatarstan, attracted more than 500 participants from 26 countries and 14 regions of Russia, and saw international interest in the region’s investment opportunities continue to grow. The predominantly Muslim region of Tatarstan, located 500 miles east of Moscow, is one of the leading regions in Russia in terms of attracting investment. In early June, the region’s capital, Kazan, hosted the 6th International Economic Summit of Russia and the OIC Countries – KazanSummit 2014. Since the early 2000s, the Russian regions have had to independently attract investors and provide them with long-term projects. These reforms were introduced by then Minister of Economic Development and now head of Russia’s largest state-owned bank Sberbank, German Gref. Tatarstan, with its 54 percent Muslim population, has become one of the leaders in this process. According to a report entitled “The National Rating of Russian Regions” commissioned in June 2014 by the Ministry of Regional Development, Tatarstan is ranked fourth in the country in terms of investment attractiveness. In 2013, the economy of Tatarstan received more than $400 million in foreign direct investment, with accumulated foreign investments in the country topping $4 billion, said President of Tatarstan Rustam Minnikhanov at the opening of KazanSummit. A portion of the funds are being invested in the region's economy by Islamic investors, which is why KazanSummit was originally conceived. According to official data, Tatarstan's exports for the past year totaled $7.6 billion. This is the largest figure in the Volga Federal District, the central part of Russia along the Volga River. “Right now there is an emerging trend of bringing in more Islamic banking capital to the Tatarstan market, which is built on a principle that is entirely new to Europeans," said Anton Soroko, an analyst at investment holding company Finam. According to him, platforms like KazanSummit, which are dedicated to discussions of key development issues, are crucial. 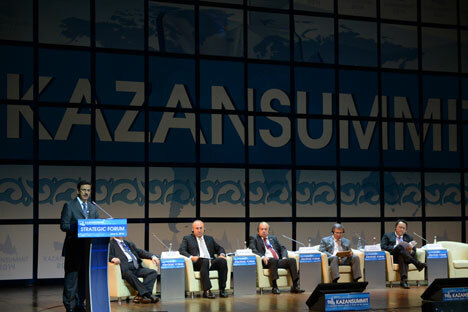 In 2014, KazanSummit was so popular that it was attended not only by members of the Organization of Islamic Cooperation (OIC), but also by China, Malaysia, Indonesia, and Thailand. In total, the forum registered more than 500 participants from 26 countries and 14 regions of Russia. Officially, the theme of the forum was food security, but the participants covered many other topics. “The most relevant areas of cooperation between Tartarstan and the OIC are Islamic banks and the production of halal products,” said the Turkish representative of the OIC, Nadi Audin, at the forum. According to him, the laws of Islam forbid people from earning money from speculation. Experts currently estimate the volume of Islamic banking in the world at $1.5 trillion. AK BARS Bank of Kazan already uses financial tools in accordance with Sharia law. Specifically, the bank has made two murabaha transactions. This is a special type of lending in which the seller directly indicates the costs incurred by the goods sold and sells them with an already specified mark-up. Besides this, as reported at the summit in Kazan, the insurance company Allianz Life is actively developing Islamic insurance. A forum on international trade was also held on the last day of the summit, in which the participants agreed that Kazan could serve as the center of the new Eurasian Economic Union. The First Kazan Urban Forum was also held as part of the summit. To date, Kazan is the first Russian city to establish its own intelligent transport system, which has been done with the support of Austrian company Kapsch. The urbanists discussed four main topics: harnessing the potential of Kazan’s agglomerations, the evolution of its waterfronts, the reorganization of industrial zones, and park management. In addition, Kazan-based companies received offers from international investors during the summit. The OIC invited Tatar companies to participate in a strategic project to build a 6,200-mile trans-African railway between Senegal and Port Sudan, while Qatari international investment holding company IAS also announced contracts with the largest Tatar oil company, Tatneft. IAS is interested in the technology and experience of Russian companies.